If you are looking for a bag that is both stylish and functional, get your hands at the Imprinted Laminated Tote. These bags can be used for a variety of purposes including delivering the customer’s orders, placing purchased goods, or for everyday use. The front pocket in this bag makes it much more appealing and spacious. 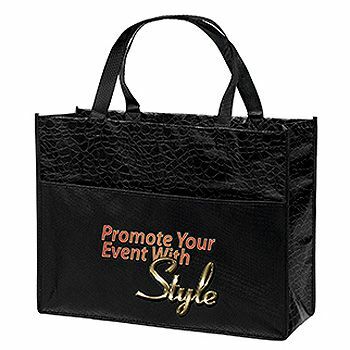 Stylish and Spacious Imprinted Laminated Totes to Promote Your Brand! The Imprinted Laminated Totes are not only high quality, but also quite versatile. You can use them as courier bags, grocery bags, gift bags, or simply as your everyday bags. Made from quality materials, these bags are 100% recyclable, helping you save money. The gloss laminated finish on the bag makes it ever more appealing and unique. You can offer these totes to your customers purchasing goods from your store to enhance your brand image.